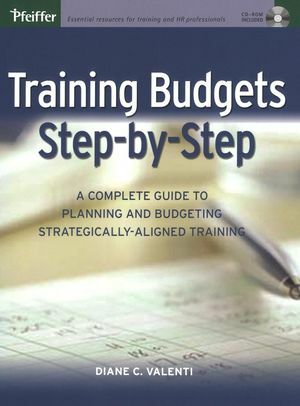 Written by training expert Diane Valenti, the book shows you everything from how to conduct the data gathering process to help determine the types of training to create to how to present a completed budget¾one that aligns strategically with your organization's goals. Every step of the way the author provides a wealth of templates, worksheets, lists of questions to ask, action plans, flow charts, interview summary sheets, and other helpful job aids. Training Budgets Step-by-Step also includes a CD-ROM that contains the book's worksheets and templates that can be easily reproduced and customized. Diane Valenti, president of Applied Learning Solutions, Inc., fifteen years' experience in instructional design. She specializes in creating systems, job-specific processes and procedures, and new product training for Fortune 1000 companies. Step 1: Gather Data from the Executive Suite. Step 2: Gather Data from Division/Department Managers. Step 3: Gather Data from Additional Sources. Step 4: Enter Existing Courses into the Training Plan and Budget. Step 5: Determine New Courses. Step 6: Determine Delivery Methods. Step 7: Determine Course Length. Step 8: Decide Whether to Make or Buy the Training. Step 9: Create a Training Budget. Step 10: Prepare to Present the Training Plan and Budget.